On the morning of Friday, October 19, 2018, Rosie Clites passed away peacefully surrounded in love by her three sons after a decade long battle with various types of cancer. Throughout that battle, Rosie chose joy, having never once complained and instead, held on to her cheerful spirit. Rosie’s life began on January 23, 1944, in Eureka, Kansas. She is the daughter of Harrel and Elizabeth (Williams) Shaw. On February 3, 1962, Rosie was united in marriage to Terry Clites in Eureka. He preceded her in death in 2014. Terry and Rosie raised their family in Eureka and remained there until 1989, when they relocated to El Dorado. Rosie loved to travel with family and friends, playing cards (she especially delighted in beating her sons in a game of cribbage), found solace in tending to her yard and flowers, was known to enjoy a little bit of shopping, and was quite the pie baking aficionado. 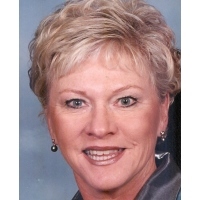 She was an avid golfer most her adult life and was once crowned El Dorado Women’s Golf Champion. Rosie’s real and abiding passions, however, were spending time with her friends, supporting her boys and grandchildren in all events in which they participated, and doting on her cats. With her ornery wit and loving smile, Rosie instilled a zest for joy and amusement in every person that knew her. She was a member of the First Presbyterian Church of El Dorado. Rosie is survived by her sons, Brian Clites, Brad (Nancy) Clites and Tracy (Amy) Clites, all of El Dorado; grandchildren, Ashlyn (Arli) Lindskog, Taylor Clites, Kelcey Clites, Kailey Clites, Kaden Clites, Tanner Clites and Caleb Clites; great grandson, Lincoln Lindskog; siblings, David (Nancy) Shaw of Nenana, Alaska, Pat Shaw of Waverly, Iowa, Paul (Beth) Shaw of Park City, Marcia (Geoff) Dahlman of Topeka and Alan (Kathie) Shaw of Nenana, Alaska and many nieces and nephews. She is preceded in death by her parents, husband, Terry, brothers, Darrel and Curtis Shaw and a sister, Beth Wharry. Her family will gather with friends on Friday October 26, 2018, at 1:00 p.m. at the First Presbyterian Church of El Dorado. Services will be led by Pastor Ruth Waite, and Rosie’s sister, Pastor Pat Shaw. She will be laid to rest in Greenwood Cemetery, Eureka at a later date. Carlson Colonial Funeral Home is serving the family. Memorial contributions in her name may be directed to Susan B. Allen Memorial Hospital Foundation.